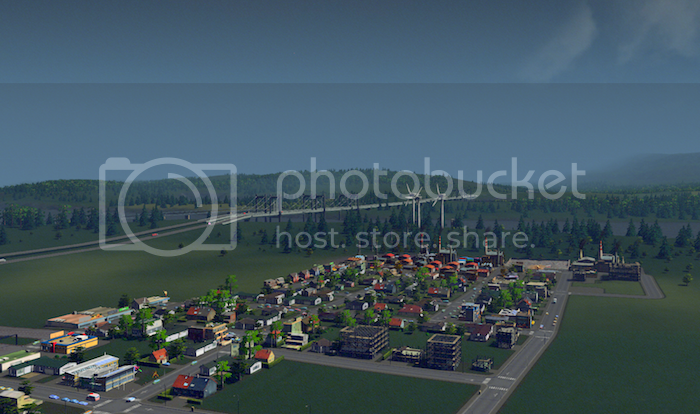 I am thinking of buying this game "Cities: Skylines". It's looks like SimCity should have been! Made by a company in Sweden and with emphasis on single-player building and management of cities. They seem to massively support modding for their games and there's already a couple of mods available ahead of the game's release that allow you unlimited funds and unlocks all buildings - so you can use it as a sandbox building game if you want. And I do want. You can have quite big maps and it says it is "easy to learn but difficult to master", which sounds perfect as you could just muck about building stuff and watching things progress, or you could make it a real challenge and much more involved. You can put different districts into your big map and they can operate under their own local laws. LGR is playing a copy at the moment (presumably they released some for game reviewers to try out, although there's no beta or demo for general use) so I'm looking forward to his upcoming review, but from looking at the website and trailers I'm already pretty sure I'll get it. I was so disappointed with the recent SimCity, but this could be a great alternative! My only fear is that I will become too engrossed and lose whole days of my life to sorting out crime rates or sewage treatment. It does look pretty great and it's almost half the price of Simcity at the time of release. Maybe when I get a new computer I'll look into getting it. 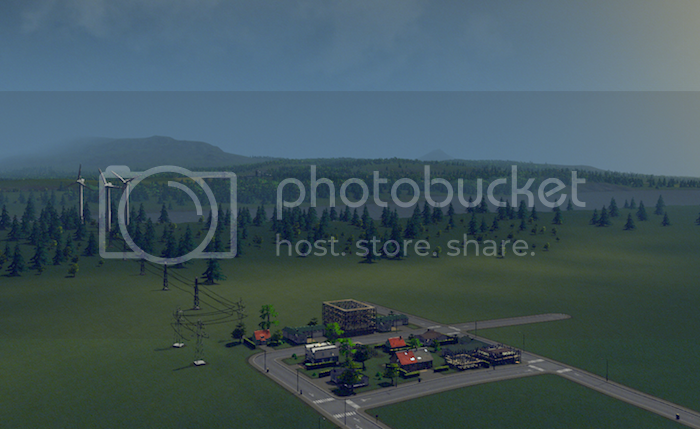 This does look like everything SimCity should have been, I am intrigued. The game seems to be real fun. To bad I never was that much into the whole Sim-City-thing. Aw, I love city-building games. I used to play loads of SimCity. My brother would always laugh at me because I'd refuse to have any power stations so my cities would ultimately fail due to a lack of adequate power from my plentiful wind turbines. But why shouldn't I build a clean energy utopia - it's my city! I downloaded Steam yesterday and am all set to get this new game. I just need to hold out for another week or two as I have stacks of work to get through and I'm afraid of the level of distraction this might tempt me to. Also it will make a fine reward when the work is done. Oh no, I'm a terrible city builder! I've only got 16 residents and the sewage is already backing up. I think I'd better start again. Ahem. (21-03-2015 04:47 PM)Caspin Wrote: Oh no, I'm a terrible city builder! I've only got 16 residents and the sewage is already backing up. City going down the pan already? I thought it was meant to be the traffic which caused all the problems in the game? Well, with my measly 16 residents shitting their way to oblivion, there wasn't much traffic to speak of. It took me a couple of false starts to grapple with how to place roads and connect power etc. It's been a long time since I played something like this. I've kind of got to grips with it now and managed to get above 800 residents without any major problems. The city is in profit, the traffic is moving and when a building caught fire the fire brigade sent two trucks and extinguished it. So there is hope for me yet! They did a patch last week that seemed to be a bug-fixer so maybe the traffic routing is better. This is why it's always best to wait a couple of weeks and let everyone test the game for you. I am gaining in proficiency! My citizens are no longer wallowing in their own excrement! I learned a lot from mucking about in my first town, Test Tube (the one with the sewage difficulties), followed by my second attempt, Petri Dish (which got totally out of control and was mostly on fire at one point). 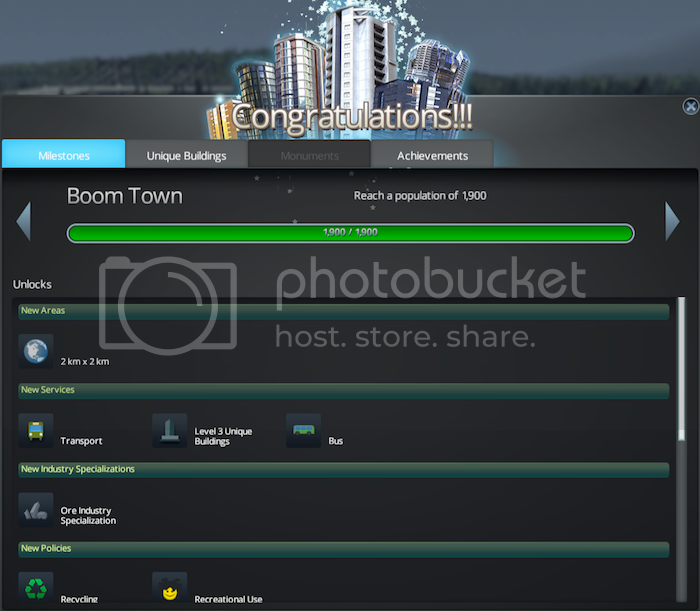 My current town, Greenville, so called because I am trying to use only green energy and have environmentally-friendly policies, is doing quite well and has reached "boom town" status! I'm sorry if the pictures look a bit dark - I've enabled some kind of temperate climate lighting for the sake of my eyeballs. The problem in Greenville currently is that I'm so distressed at the sight of virtual pollution on my virtual land that I can't stand introducing any more industry and so my town is in the red financially. For a while it was making money (not sure how) but this happy phase has come to an end. I took out loans to build infrastructure and parks but am now having trouble paying them back. I can't afford to introduce public transport, although this would be in keeping with the town's aims, and I can't afford a cemetery so there may be a slight corpse crisis soon. The challenges for this Mayor are many but perseverance is my middle name (it isn't really).